Or rather, what to do with an Irregular Miniatures 15mm Bulgarian soldier - the one that is wearing a curious hotch-potch of a uniform. The figure itself is fine and so I have been loath to condemn those that I have to the great bring and buy just yet, at least not without a fight anyhow. The answer came from an unlikely source (or perhaps not) and so I have now managed to saddle myself with a long term project that will need more than a little work but should be rather interesting all the same. It is very simple. 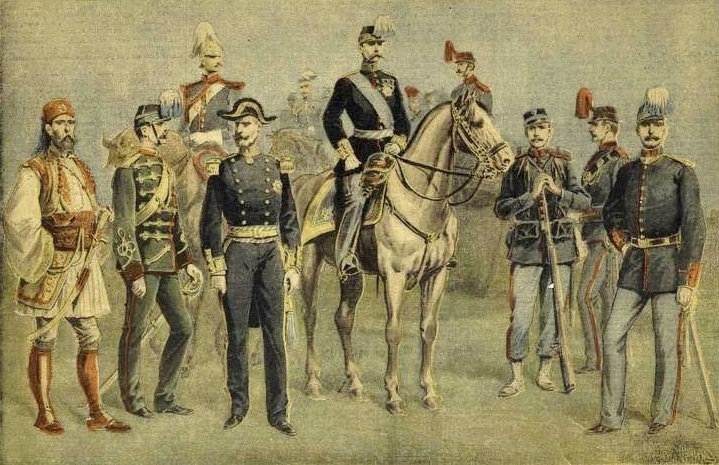 The Bulgarian infantryman is wearing a uniform that is primarily of Russian style circa 1880 to around 1905. However, it also has some modern touches. This got me thinking and so I am now considering having a Balkan war set up for circa 1900 rather than the historical 1912. 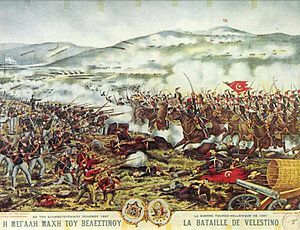 This has a number of attractions (and bear in mind Turkey and Greece went to war in 1897 over the Cretan issue - with the Great Powers maintaining a watching brief over proceedings and the picture above is from the war itself), not least of which is the fact that the troops involved are certainly colourful (Albanian irregulars anybody?) but also the fact that any amount of obsolete kit could be used as the Great Powers would be keen to ensure that peace is maintained in the region and no single power becomes too prominent. The naval aspect would also figure and so the prospect of inflated navies using 1880s vintage surplus kit is very appealing - not to mention great fun to build and play with. The Great Powers can also feature to an extent and many figures etc are available and can be pressed into service. I am taking a weeks holiday later this month and so the planning of this will be my project whilst I am away - at a low level I already have a reasonable amount of kit from the 1912 war which could easily be used for this idea so I will give it some further thought and see what comes out of the wash. I have gamed the naval aspects of the war of 1912 on numerous occasions and so the land side came as a logical extension The whole region was simmering with intrigue and unease since at least around 1877 and so the potential for games is huge. It is a long term idea that will need some work so I will spend dome time on it whilst on holiday and see where it goes. I agree about the uniforms prior to 1912--very much more colorful, although some of the older versions were still worn during the war. Balkan history is fascinating--it seems like just about every country went to war with just about every other country at one point or another. Makes one wonder how any alliances at all were formed for either of the Balkan Wars! It certainly has a soap opera aspect about it and no mistake! The beauty of it is that a whole lot of stuff can be used and bearing in mind the Great Powers were historically much in evidence there is a lot of scope for escalating their involvement. Needless to say, I am very interested in the naval possibilities!